In readily accessible language, evolutionary biologist Dr. Judith L. Hand explores, from a biological perspective, the root causes of war and explains why war is not an inescapable facet of human nature. 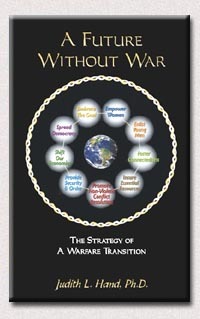 Drawing upon diverse fields from biology to anthropology to psychology, the author outlines a coherent strategy to end war, setting such a campaign in its historical context and explaining why a great paradigm shift in conflict resolution, from economies based on war to economies based on ending war, could occur within a relatively short period of time. (see also www.AFutureWithoutWar.org). A book to be read, savored, and shared with anyone wanting to help create a better world. "Unless people believe peace is possible, it never will be. Dr. Hand's writing helps us understand the reasons why our early human ancestors valued social stability and cooperative relations, and I hope A Future Without War reaches the broadest possible audience." "The more we learn about the long march of war, the more concerned we should be to change our ways. Judith Hand's call for a positive vision is determined, thoughtful and well-informed. This book reminds us that we have already come a long way and shows how solutions get found: they get inspired." "Nothing is more important for our children than to end our long history of warfare. Judith Hand's A FutureWithoutWar empowers us to materialize the compassionate reality envisioned by every major spiritual leader from pre-Biblical times to the contemporary Dalai Lama. Read her book — and take action." "People by the thousands around the world work in human service jobs, "pulling babies out of the river" every day, and that can be discouraging labor when nothing fundamental seems to change. This important and dramatic work by Judith Hand helps us see 'why the babies are falling in', and gives us energy and courage to go on because we also see that a future without war and much less violence is a real possibility. Entrenched systems that support violence can change!" "Dr. Hand continues to be one of our most provocative and insightful thinkers. Her ideas are fascinating and should give both women, and the men they love, a lot to think about and consider. This is a vision that offers hope and realism at the same time." "For humanity living under the darkening shadow of nuclear proliferation and ever more lethal international conflict, Dr. Judith Hand offers an inspiring vision. In an extremely readable style, she challenges status quo thinking that accepts and perpetuates the war system. She clearly outlines integrative steps that could lead humanity toward a positive, peaceful future. Sensible and sorely needed."